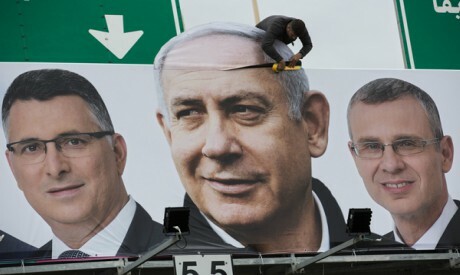 Israeli elections: Can Netanyahu be unseated? The most salient feature of the climate in Israel in the run-up to general elections set for 9 April is the determination of most Israeli parties to unseat Prime Minister Binyamin Netanyahu after 10 consecutive years in power. Some opposition parties, such as the Labour and Yesh Atid parties, have the more ambitious goal of ousting government by the right, as a whole. But opinion polls show that the right-wing parties in their various shades are still more popular than the left, centre and Arab parties. So, the next government will almost certainly be another right wing one. Parties opposed to Netanyahu had also hoped that he would have been brought to trial already in connection with allegations of corruption that the Israeli police have been investigating for two years. However, for fear of being accused of deliberately attempting to influence Israeli voters in favour of the opposition, the Israeli attorney general has agreed to defer releasing the evidence against the prime minister until after the elections. In view of the prevalent right-leaning political mood, it appears that the opposition parties’ only hope for toppling Netanyahu rests with the courts at a later date. This widespread hope among the opposition reflects a profound crisis that has afflicted the Israeli political system since the turn of the century: a grave deterioration in Israeli confidence in democracy. Successive reports by the Israeli Democracy Institute depict a mounting preference for an autocratic strongman over institutionalised decision-making mechanisms such as parliament. This is not to suggest that democracy, in form, is in jeopardy in Israel. However, the growing tendency to look for a strongman and vote for his party, regardless of that party’s political platform, is sapping Israeli democracy of its substance. The trend has led Shlomo Avineri, professor of political science at the Hebrew University and former director-general of the Ministry of Foreign Affairs, to hold that political parties in Israel suffer a dual crisis: an ideological emptiness and the prevalence of “personalisation” of politics. The media commotion over political issues focuses on individual personalities, as opposed to political groups or bodies, and political party structures have been thrown into havoc as a result. Conventionally, the political party relied on a permanent and active membership, with activities in the branches, and party conferences and meetings to discuss policies and ideology. This has been replaced by the “registration institution” that enables people to officially join a political party shortly before an election and to take part in the process of choosing candidates. In the framework of the aforementioned political crisis, political parties have been hunting for a personality to rival Netanyahu. In view of the general belief that security is what most concerns Israeli voters, the opposition has resorted to forwarding figures from the military establishment as a means to reassure voters, on the one hand, and to wrest the “security” card from Netanyahu. The prime minister has long cast himself as the sole political leader capable of delivering on security. He points to his success in achieving deterrence along the northern front (Syria and Lebanon) over a whole decade. Hizbullah has not staged a serious attack against Israel during this period, despite the blows that Israel has delivered to it, the most recent being the unearthing of some border tunnels earlier this year. To the south, major confrontations with Hamas have grown less frequent. It has been five years since the last major intervention in the south, which had occurred in two to three-year intervals in 2009, 2012 and 2014. In other words, Netanyahu, in the current elections, can boast of having ensured Israeli security for five years. To neutralise Netanyahu’s claim to being the only candidate capable of ensuring Israel’s security needs, three parties (the Israel Resilience Party, Yesh Atid and Telem) came together to form the Kahol Lavan (Blue and White) electoral alliance. Their list is headed by former chief of general staff Benny Gantz and Yair Lapid, chairman of the Yesh Atid Party, and it includes other generals — former defence minister Moshe Yaalon and Gabi Ashkenazi, another former chief of general staff — as well as a former deputy director of the Israel Security Agency Shin Bet and a former deputy director of Mossad. The line-up clearly sends a message to the Israeli voter that, when it comes to security, Kahol Lavan has expertise and capacities far superior to Netanyahu’s (who is not a member of the military establishment). But will Israeli voters be convinced enough to opt for this list over Netanyahu and the Likud? Propelling generals to the fore has not always been the key to success in Israeli politics. The Labour Party was unable to halt its decline in the Knesset by choosing a former general, Amram Mitzna, to lead it in 2014. Ehud Barak, the Israeli leader with the most security experience (he served as director of military intelligence, chief of general staff and minister of defence), proved unable to steer the Labour Party back to pre-eminence when he chaired it from 2009 to 2013. In its campaigns, the Kahol Lavan alliance has homed in on two basic issues: security and corruption. On the former, Gantz has said that he is the only one capable of keeping Hamas reined in, reminding voters that he “sent parts of Gaza back to the Stone Age” (he commanded Israeli troops during the 2014 war against Gaza). On corruption, on a number of occasions, Gantz has charged that Netanyahu raked in 16 million shekels in illicit gains in the German submarine deal. He called it “the greatest security-related corruption case in the history of the State of Israel”. The Likud and Netanyahu’s campaign manager accused Gantz of lying because investigations have shown that Netanyahu was not personally involved in the scandal, even if some of his close associates were. According to an opinion poll aired on Israeli Channel 13 on 21 February, the Blue-White list would win 36 seats in the election, while the right-wing Likud Party’s share of Knesset seats would drop to 26. A similar poll by the same channel aired on 12 March showed the Kahol Lavan receding to 31 seats and the Likud’s share rising to 28. The rest of the seats were distributed as follows: United Right 7, Labour 7, Arab-majority list Hadash-Taal 7, Meretz 6, United Torah Judaism 6, the New Right 6, the United Arab List-Balad 5, Shas 5, Yisrael Beiteinu 4, Hawiya 4 and Kulanu 4. By the time of the last survey aired by the same channel on 30 March, the Kahol Lavan and the Likud were tied at 30 seats each. It should be borne in mind that such polls are not accurate gauges of election results. For one, between 25 and 35 per cent of those polled are still undecided and elections can always pack surprises because of swing votes. After his defeat against Netanyahu in 1996, Labour Party leader Shimon Peres said, “opinion polls are like perfume: nice to smell, dangerous to swallow.” Only the day before the 1996 general elections, the opinion polls had tipped Peres as the winner. But even supposing that the elections yield Channel 13’s 12 March prediction, namely that Kahol Lavan beats Likud by three seats, the same poll gives the right, as a whole, at least five seats more than the centre and left-wing parties (Kahol Lavan, Labour, Meretz and the Arab lists) put together. In other words, Netanyahu still has a big chance of leading the next coalition government in Israel because Kahol Lavan’s three seat lead would not be enough to form a government without some party from the right. On the other hand, even if some of the right-wing parties could be convinced to join a coalition with Kahol Lavan, the government would find itself constantly subjected to blackmail over economic, social and security policies that incur the disapproval of the Israeli right in general. The crisis of the political system of the Hebrew state casts a shadow over the forthcoming elections. In the opinion of observers both inside Israel and abroad, that state, long vaunted by its leaders as an “oasis of democracy” in the Middle East, has lost its affinity with the Western democratic model. The Likud’s and Netanyahu’s perpetuation in power for 10 years, the promulgation of racist laws such as the nationality law, the attempts to erode the independence of the Supreme Court, the restrictions on NGOs and civil society as a whole, the relentless attacks against the press and Netanyahu’s attempts to control it are among the many phenomena that indicate that Israel now suffers the same ailments as its neighbours, not least of which is scepticism in the concept of democracy as a foundation and framework for government. It is therefore difficult to predict, with any degree of certainty, that the Israeli right in general, and Netanyahu in particular, will lose in the next elections. For two decades, the Israeli electorate has showed a preference for a strongman over a candidate faithful to democratic governance, which presumes an ability to make choices on the basis of rational choices between alternative political platforms and policy choices. Netanyahu banks on the force of his personality, which has enabled him to remain in power for a decade, though Trump’s recent recognition of Israeli sovereignty over the Syrian Golan will probably help the right-wing leader’s prospects. So, it appears that his adversaries’ strongest hope remains the corruption trial, although if and when that happens Israel will be plunged into a greater crisis, unless it can come up with a strongman like Netanyahu to contend with the many security threats, and to take the difficult decisions when Trump unveils his plan for resolving the Palestinian-Israeli conflict. *A version of this article appears in print in the 4 April, 2019 edition of Al-Ahram Weekly under the headline: Israeli elections: Can Netanyahu be unseated?